My service at Denison is motivated by a commitment to create inclusive communities that provide a space for learning and personal growth. Consistent with Denison’s mission to build student capacities as active citizens, I have worked to develop and promote co-curricular involvement experiences grounded in student learning and meaning-making. Facilitating the work of the CLIC team and supporting leadership education programs at Denison is fulfilling and exciting work! Prior to coming to Denison in 2013, I worked professionally in the areas of leadership development, student activities, residence life, and fraternity and sorority life. I earned my Master’s Degree in College Student Personnel from the University of Louisville, and I am currently a doctoral candidate in the Azusa Pacific University PhD in Higher Education. When not studying or with students, I enjoy reading, playing competitive rugby, and staying involved in my local church. I am happily married to a physician at Ohio State University and am the parent of a rambunctious terrier! My research seeks to investigate how to better facilitate holistic student success through co-curricular and programmatic initiatives. My research on quality co-curricular involvement experiences that and student thriving will also serve to fulfill the requirements for my doctoral dissertation. The attitudes and behaviors of faculty that contribute to thriving students of color has been another emerging research area of interest. Schreiner, L. A., Louis, M., Vetter, M. K., Vance, R., Guzman, C., Seto, K. Kuhn, R. (2017). Moments that matter: The role of “microaffirmations” in the ability of students of color to thrive in college. Paper presented at the annual meeting of the Association for the Study of Higher Education, Houston, TX. Vetter, M. K., Schreiner, L. A., & Jaworski, B. (2016). Faculty attitudes and behaviors that contribute to thriving in first-year students of color. Paper presented at the annual meeting of the Association for the Study of Higher Education, Columbus, OH. Vetter, M. K. & Kingerly, J. (2017). Rethinking recognition: Using a values framework to recognize and promote best practices in student organizations. Presented at the meeting of American College Personnel Association (ACPA), Columbus, OH. Vetter, M. K. & Pariano, N. K. (2015, March). Balance this! : Rethinking student involvement on campus. Presented at the meeting of American College Personnel Association (ACPA), Tampa, FL. Vetter, M. K. & Pariano, N. (2015, March). “Balance This! : Rethinking student involvement on campus.” American College Personnel Association (ACPA) Convention, Tampa, FL. Vetter, M. K., Morettes, E. T., & Eberly, C. (2011, March). Avoiding Animal House: Student thriving in Greek residences. 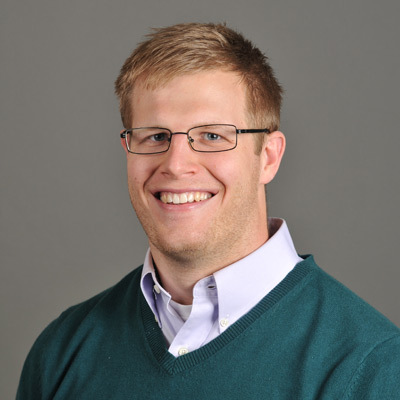 National Association of Student Personnel Administrators (NASPA), Philadelphia, PA.
With a doctoral degree now under his belt, Matthew Vetter aims to better the Denison community through the implementation of his PhD research.